If you need acoustic ceiling tiles in Glen Burnie, MD, let us help you get your volume under control. 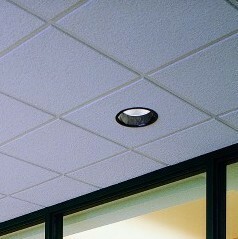 Acoustic ceiling tiles have been a staple product for years in spaces where the decibel level needs to be muted or controlled. They are exceptionally effective for spaces of any size, architectural style, and overall square footage. When adhered directly to a ceiling or even used to construct a drop ceiling, our acoustical ceiling tiles provide noise control and dampening. At Couser Supply, Inc. our inventory includes acoustic tiles in a considerable variety of materials, sizes, and designs. That means we have what you need to create a simple and effective solution for improving the acoustic qualities of your space. There are many advantages to installing acoustical ceiling tiles in any space, but particularly an office or commercial space. Excessive noise and lack of privacy due to sound carrying throughout an office environment are some of the leading complaints in today's workplaces. In addition to creating an uncomfortable work atmosphere, there are studies that indicate being exposed to poor indoor acoustics can negatively affect an individual's health over time. You can increase the efficiency and comfort of your employees with this very simple installation. The noise-dampening effects minimize stress caused by phone calls, questions to coworkers, or even meetings and conference calls, creating a more positive and productive work environment. Communication can be less stressful and employees will be able to concentrate much more effectively. Since they are light-reflective, acoustic tiles can also save money on utility costs. We also specialize in commercial ceilings. We have many different types of acoustic tiles for our customers to choose from. We ensure that when you work with us, you get the form and the function you want and need. Due to the fact that they hang from the ceiling, these tiles are handy for hiding pipes, wires, and other unsightly architectural necessities, while still allowing for easy access to complete repairs or remodeling projects. This makes them a great choice for basement remodels as well. Whether you decide to go with a standard option or something more specialized, you won't be disappointed by the performance of our tiles. Available in differing levels of fire resistance and even humidity resistance, some tiles may even be painted a color of your choosing. In addition to office building spaces, our acoustic tiles are also beneficial for schools and health-care centers. Contact us today to speak with one of our knowledgeable associates and find out more about our acoustic ceiling tiles. We proudly serve customers in Glen Burnie, Maryland.